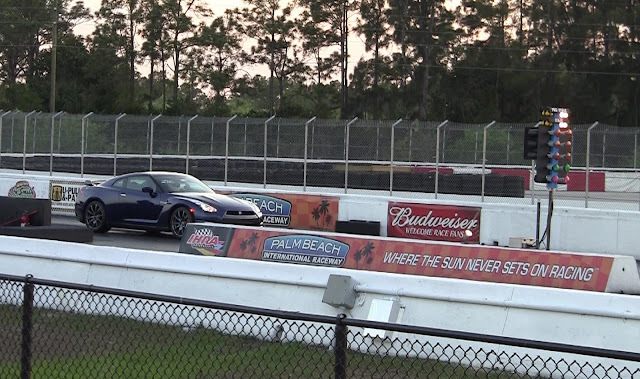 Dragtimes took a Deep Blue Pearl 2012 Nissan GT-R, and put it on the dyno and the dragstrip to test its real world performance. The numbers are every bit as Nissan claimed. 0-60 in 2.8 seconds as verified with the VBOX. Best of three runs was an 11.0@124mph. On the dyno the DBA put 474 horsepower to the wheels on a Mustang dyno, most CBA's put 430 horsepower to the wheels on the same dyno. The new power, along with the revised LC4 launch control 4,000 rpm launches add up to a nearly 0.7 second improvement in quarter mile times. We dyno tested the 2012 Nissan GT-R on a Mustang AWD dyno at HP Logic in West Palm Beach, FL where it put down 474 horsepower and 420 ft-lbs of torque to all 4 wheels. Check out the video below and the full story, time slips, and dyno chart over at Dragtimes. On a better air day, we should see some stock 2012's break into the 10 second range. Modified DBA's should be easily able to break into the 10's. Great Guns! However, I would like to know what time that 2012 GT-R runs the 1/4 mile without having its 4000 RPM launch control system turned on? I wonder how fast it would be with only 3 wheels? I wonder how fast it would be hauling a trailer full of donkeys? why do some people make stupid, meaningless comments, rather than appreciate the cars excellent performance gains over last years model. why do people make stupid comments rather than appreciate the cars excellent performance gains compared to last years model.